Note: Many of the links on this page are to Web Sites other than the current one and will open new pages or tabs in your browser. To return to this page close the new page or tab. W S Prince's Service: 9 May 1905 - 23 May 1906. Rank: Boy Second Class; Boy First Class from 14 December 1905. W S Prince's Service: 24 May 1906 - 9 September 1906. Rank: Boy First Class. 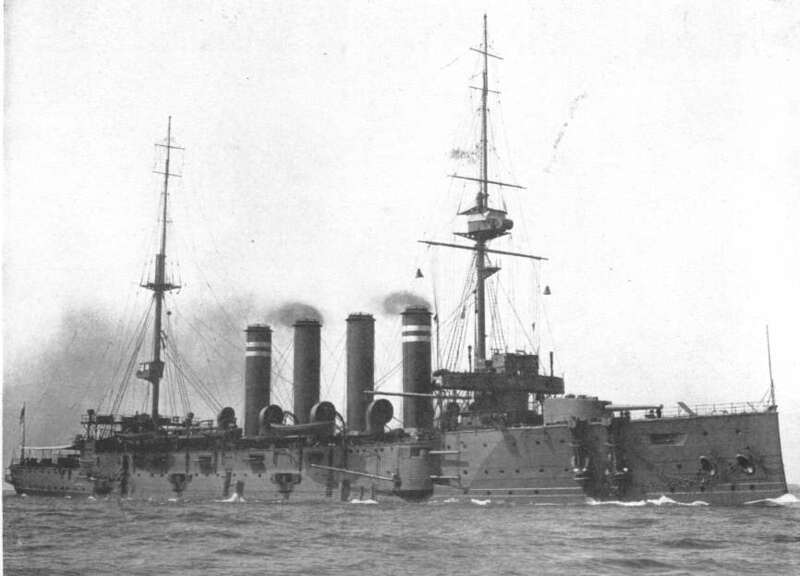 Armoured Cruiser. 12,000 tons. Devonport, in reserve. Ordered to be completed 15 May 1906 and to replace 'St George' in the Fourth Cruiser Squadron. Submarine U29 was sunk 18th March 1915 by Dreadnought ramming her. Capt von Weddingen had sunk Hogue, Cressy, Aboukir [all on 22nd September 1914] and Hawke. Click here for a photograph. W S Prince's Service: 10 September 1906 - 30 September 1906; 16 June 1908 - 29 June 1908; 8 February 1911 - 17 November 1911. Rank: Boy First Class (1906); Ordinary Seaman (1908); Able Bodied Seaman (1911). Devonport Shore Base, now known as HMS Drake. W S Prince's Service: 1 October 1906 - 1 January 1907. Rank: Boy First Class. Twin Screw Battleship. 14150 tons. Based at Devonport. Royal Sovereign Class (Royal Sovereign, Empress of India, Ramilles, Resolution, Revenge, Royal Oak, Repulse) built between 1892 and 1894. A considerable advance over all predecessors, and at the time no equal in any foreign navy. Total weight of broadside 5,500lbs. 4 13.5in. guns mounted in armoured barbettes 17ins. thick but without hoods or shields. 6in. guns installed in casemates after reconstruction in 1902. The ships of the Class rolled excessively at first so a bilge keel was fitted, which helped considerably. Also carried as far as possible the maximum coal stowage of 1400 tons. Each ship cost approximately £770,000 excluding guns. W S Prince's Service: 2 January 1907 - 15 June 1908. Rank: Boy First Class; Ordinary Seaman from 23 July 1907. Twin Screw Battleship. 16350 tons. Based at Devonport. King Edward VII Class (King Edward VII, Commonwealth, Dominion, Hindustan, New Zealand, Hibernia, Africa, Brittania). The last ships to be designed by Sir William White, they were completed 1905-1906 at a cost of about £1,240,000 each. 9.2in. guns were carried in single turrets, turned hydraulically. The 6in. guns were in batteries between them. Fired a broadside of 4,660lbs. Sides protected by a 9in. main belt of Krupp steel, 285ft. long by 7ft.6in. wide, tapering at each end to 4ins. Completed in January 1907, one month after the Dreadnought which made her obsolete. 1912 a plane landed on the ship whilst moving at 10 knots - the first time this had been achieved. W S Prince's Service: 5 January 1909 - 28 February 1910. Rank: Able Bodied Seaman. Twin Screw Battleship. 14,900 tons. Guns 4 12in; 12 6in; 16 12pr; 4 3pr. Home Fleet Devonport. Majestic Class (Majestic, Hannibal, Prince George, Victorious, Jupiter, Mars, Caesar, Illustrious), constructed 1894-1896 at a cost inclusive of guns of £1,000,000 each. 4 12in. guns were fitted in hooded barbettes, hoods being of 10in. steel plate all round, considerable angled to deflect hits. These hooded barbettes eventually came to be known as turrets, although differing in principle from the original conception of a turret-mounted gun. Four submerged torpedo tubes installed with an above-water stern tube. 9in. main belt of armour made from Harvey case hardened steel plates, giving same protection as eighteen-inch belt of composite armour fitted to earlier ships. Magnificent, Mars and Hannibal had guns removed to equip the new monitors which were to be used on the Belgian coast. In September 1915 they were sent to the Dardanelles to act as transports in co-operation with the Army. The evacuation of Anzac and Suvla took place on 19th December, and Hannibal assisted in the rescue of 83,048 troops, 186 guns, 1,697 horse drawn vehicles, 21 motor vehicles and 4,695 horses and mules. W S Prince's Service: 1 March 1910 - 7 February 1911. Rank: Able Bodied Seaman. St Vincent Class (St Vincent, Collingwood, Vanguard). Completed in 1910. 24,500 HP raised by 18 water tube boilers and Parsons turbines. Maximum speed 21 knots. 10 12in.guns mounted in 5 turrets. Served at Jutland with the Fourth Battle Squadron. Destroyed at Scapa, July 1917, with loss of nearly all ship's company. Court of Inquiry considered explosion due to faulty cordite. 804 men were lost when the ship exploded. "At 2330 on a fine summer evening in July 1917, when the Battle Fleet was settling down for the night, the Vanguard blew up with a shocking explosion which rocked the next ship in line, Collingwood, and lit up the whole sky with its glare. In three minutes she disappeared, leaving behind her an immense column of smoke, some burning oil on the water, and a small target at which she had been firing that afternoon in the Flow. Searchlights were turned on the scene and boats were got away, but there were only 2 survivors from those on board. A whaler was recovered at a distance of several miles which gives an idea of the force of the explosion. A number of the Vanguard's officers had a lucky escape for they had been attending a "sing-song" on board another ship, and were actually on their way back in the Vanguard's picket boat when the explosion occurred. "There is some reason to believe that the disasters of the Bulwark, Natal and Vanguard were the work of an enemy agent. He was found to have been employed as a dockyard-man in all three ships just before they blew up, and was on board the Vanguard at 1700 that afternoon. He was put under arrest, and no doubt, in due course, he paid the penalty he deserved, but officially the details have never been made known." W S Prince's Service: 198 November 1911 - 3 June 1912. Rank: Able Bodied Seaman. W S Prince's Service: 4 June 1912 - 7 September 1919. Rank: Able Bodied Seaman. Battle Cruiser. 26,350 tons. Guns 8 13.5in; 16 4in; 4 3pr. Flagship of Rear Admiral commanding the First Battle-cruiser Squadron. Lion Class (Lion, Princess Royal, Queen Mary). Lion completed at Devonport 1912, Princess Royal at Vickers in the same year, Queen Mary at Palmers in 1914. Cost £2,000,000 each to build. 9in. armoured belt amidships, reduced to 4ins. at each end. 2in. armoured deck, 9in. armour on turret sides. 2 21in. submerged torpedo tubes. On Trials in 1912 exceeded 31 knots and burnt 950 tons of coal in a day. Capable of 33 knots. 3,500 tons of coal and 1,000 tons of fuel oil carried. Received damage to engine-room at Dogger Bank, and hull damage at Jutland, also a hit on Q turret. Turret flooded on order of officer-in-charge to avert same fate as Queen Mary [fire travelled to magazine and ship blew up]. For a time after the War, Lion formed part of the Atlantic Fleet under Admiral Sir Charles Madden. Discarded after the Washington Treaty of 1922. Lion broken up in January 1924.